Leon County now has SINGLE STREAM recycling! This means ALL recyclable materials can be placed in your curbside recycling cart. No need to separate paper items from containers. 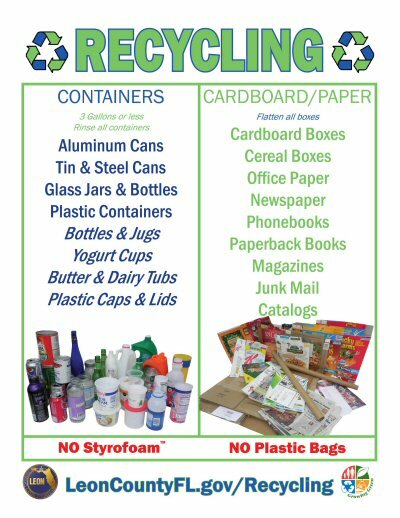 DO NOT bag your recycling, simply place the recyclable items in your green, curbside container. Please place garbage and recycling carts 3' apart at the curb, away from mailboxes and power lines. Make sure the wheels and handle are closest to your house. CLICK for more recycling information. Education Programs - NO money for a field trip? Let the field trip come to you! Event Recycling containers for your next event!